There are a number of taxonomic synonyms for Aloe vera: A. barbadensis, A. indica, A. perfoliata, and A. vulgaris. However, the most widely accepted name among botanists is Aloe vera. The species most frequently used as herbal medicine is Aloe vera. 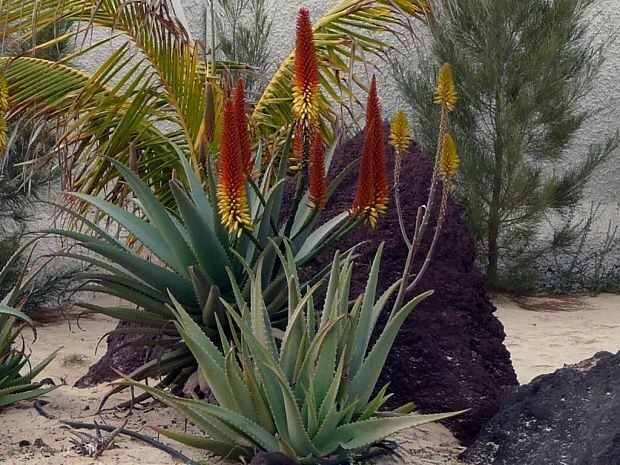 A. perryi and A. ferox are also cultivated as medicinal plants and have many of the same properties as “true aloe”. Common Names: Aloe, true aloe, burn plant and lily of the desert. 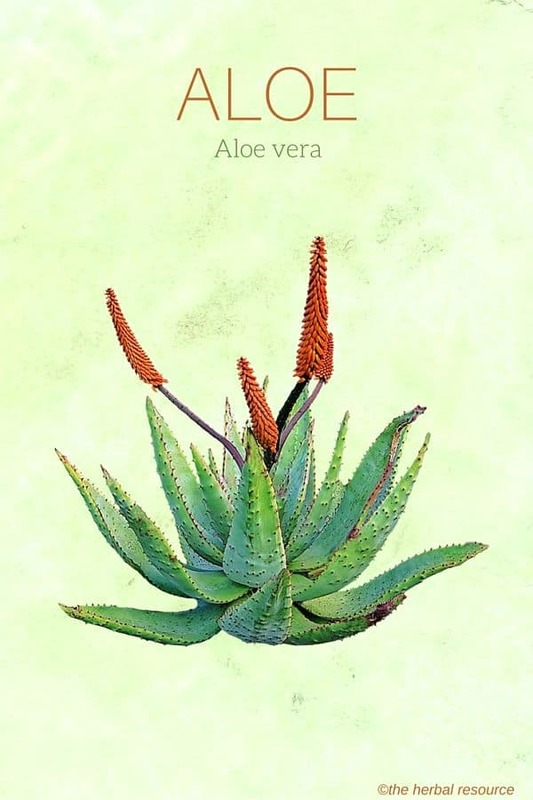 Distribution and Habitat: Aloe vera is native to southern Africa and grows well in sunny, dry climates. Like other succulent plants, it survives with a little water. The plant was known to the Ancient Greeks and Romans and cultivated by them. It has been spread to other regions of the world that have a suitable climate for cultivation. Aloe vera continues to be an important traditional medicine in its native South Africa. There are over 100 species of aloe occurring there and at least half of these are still used as medicine to treat infections, swelling from injury, digestive problems, and even to eradicate parasites. Today, aloe vera is a common house plant around the world and thrives very well as a potted plant if placed in a sunny window. Description: Aloe vera is easily recognizable by its spear-like leaves growing from the base of the plant. These leaves are thick with water-conserving gel. In the right environment, the plant can grow to a height of three feet. Plant Parts Used: Both the gel and the latex from the leaves of aloe are used medicinally but for quite different purposes. Whether using raw aloe or purchasing a prepared remedy, one should be careful in distinguishing between the latex and the gel. The gel is the pulpy, transparent content of the split-open leaves and familiar to anyone who has used aloe to treat kitchen burns. The latex is a yellowish sap found closer to the inner skin of the leaves and which drains when the leaves are cut open. The latex is also known as ‘aloe bitters’ and is used to make ‘aloe water’ or dried into a powder. It is highly laxative! Aloe Vera Gel: The gel, more correctly ‘mucilage’, is best known for treating injuries and irritations of the skin, especially minor burns, and cuts. It is a common house plant that is often kept in kitchens as a first aid. A piece of the succulent leaf can be cut off and opened and the gel applied directly to the burn or cut. It should not be used on deep wounds. The gel increases the blood flow to the affected area. It contains two enzymes that reduce inflammation: carboxypeptidase and bradykininase. It contains the anti-histamine magnesium lactate which relieves itching from insect bites, poison ivy, and other skin irritations. It is also an astringent and has mild antibacterial action. The ability of the herb to treat burns is very well-established in the practice of medicine and it is often used in the hospital to treat burns from radiation therapy. The anti-inflammatory action of the gel means that it can also reduce swelling from bruises and sprains. This is a traditional use of the plant in the Caribbean. The active ingredient is thought to be the enzyme bradykinase. The renowned botanist James Duke also notes that aloe can help slow baldness because it can treat some of the underlying causes of hair loss such as acne, dandruff, and seborrhea. Another interesting but little-cited use for aloe vera gel is as a toothpaste cleanse the mouth and to prevent gum disease. This was recommended back in the middle ages by the famous nun and scholar Hildegard of Bingen. However, anyone who uses aloe, for this reason, must be careful not to swallow too much of it as it contains effective amounts of laxative substances! Interestingly, medical researchers are now looking at aloe vera mouthwash for particular applications, such as treating infections of the mouth as a result of radiation therapy. The slowing of hemorrhaging in critically wounded patients by using an aloe vera gel-derived polymer. Controlling blood sugar levels, with the potential of new treatments for diabetes. Protection of the pancreas against free radicals (in this case by an another species of aloe). These possible medicinal uses for aloe gel are still in the early stages of research. The evidence is from basic research in the laboratory and testing on animals. There are as yet no tests on humans, i.e., clinical trials. A mixture of naturally occurring saccharides in the gel may prove to be a treatment for Alzheimer’s disease. In a recent study at the University of Miami, patients with Alzheimer’s were given an oral supplement called “aloe poly-mannose multi-nutrient complex” (There are, in fact, commercial preparations of APMC available on the market). The researchers tracked both the cognitive functioning and immunology of the subjects over twelve months of the treatment. Forty-six percent of the subjects showed significant improvement after nine months. The side effects were few and temporary. Because stem cell production was vastly increased, it is speculated that this is the mode of action for improving motor function and memory. The study was published earlier in 2013 in the Journal of Alzheimer’s Disease. Aloe Vera Latex: The latex produced by the skin of the leaves, also called aloe juice, aloe water or aloe bitters, is quite different in chemical composition from the gel or pulp. The latex contains powerful anthraquinones including aloins, hydroxyaloins, aloe-emodin, and aloe resins. The primary use of the latex is a laxative. The principal mode of action is through the anthraquinones present in the latex, which stimulate bowel contractions. Specific compounds from the latex have been investigated for their potential to slow or eradicate certain cancers. In particular, aloe-emodin, found in the latex, is cited as a potential anti-cancer drug in the case of lung cancer, prostate cancer, and skin cancer (melanoma). In addition to aloe-emodin, there are several other quinones in the latex that have anti-cancer properties; these are juglone, β-lapachol, plumbagin, shikonin, and thymoquinone. This research is in its early stages and the laboratory tests have been on isolated cells or on animal organs. There are as yet no clinical trials to determine the efficacy in treating humans with cancer. Aloe Vera Gel: The gel is usually applied in a raw form directly to the affected skin. As well, there are numerous commercial skin lotions that contain it in different concentrations. These should be checked for other ingredients present such as preservatives and fragrances. It is also an ingredient in some nutritional supplements. Aloe Vera Latex: The latex is prepared by a herbalist. It is either made into a juice or dried to a powder. Some herbalists also prepare a tincture, and a few drops of this are mixed with water and taken at mealtime. The Commission E recommendations for use of the aqueous or powdered latex to treat constipation is 20 – 30 mg hydroxy-anthracene derivatives/day, calculated as anhydrous aloin. Note that few commercial preparations have verifiable concentrations of anthracenes or other active compounds. Specific derivatives of the latex are regulated in some countries. Aloe Gel: Topical applications of the gel is considered safe in treating skin irritations and minor burns and cuts. It should not be applied to a deep wound, serious burn, or very severe rash without the supervision of a medical doctor. Some herbal medicine sources recommend the ingestion of aloe vera gel; for example, by putting the gel in a blender and making a smoothie. This is not necessarily a safe practice, especially since the dosage is uncontrolled and too much of the latex may be mixed in with the gel. The results could be quite harmful to the digestive tract and cause other problems. Therefore, a gel preparation intended for consumption should be obtained from a reputable herbalist rather than prepared at home. Aloe Latex There has been much debate regarding the safety of aloe latex. Experts in botany and herbalism differ in their opinions on consuming the latex. At the very least, one should not attempt to make a home concoction of aloe juice and any commercial aloe juice should be assessed for standardized dosage. Some resource stress that the latex in any form, even from a reputable source, should never be used by children, pregnant or nursing mothers and by women during their menstrual cycle (as it can increase blood flow). People suffering from intestinal or kidney problems should also avoid using the latex. The ingredients in the latex can also lower potassium levels, making it dangerous when used with heart medicines. The US Food and Drug Administration banned the sale of the aloe-derived laxative as over-the-counter medicines. Duke, James A. The Green Pharmacy. Emmaus, Pennsylvania: Rodale Books, 1997. Lininger, Schuyler W., Jr, A. R. Gaby, S. Austin, D. J. Brown, J. V. Wright, and A. Duncan. The Natural Pharmacy. New York: Random House, 1999. Chevalier, Andrew. The Encyclopedia of Medicinal Plants. New York: DK Publishing, 1996. Reynolds, T., and A. C. Dweck. Aloe vera leaf gel: a review update. J. Ethnopharmacol. 1999, 68: 3-37. Duke, James A. Dr. Duke’s Essential Herbs. Emmaus, Pennsylvania: Rodale Books, 1999. Graedon, Joe and Teresa. The People’s Pharmacy Guide to Home and Herbal Remedies. New York: St. Martin’s Griffin, 2001. University of Pittsburgh Medical Center. News Release July 2004: Resuscitation fluid derived from aloe plant prolongs life after hemorrhagic shock in animal study. Ajabnoor, M. Effects of aloe on blood glucose levels in normal and alloxan diabetic mice. J. Ethnopharmacol. 1990, 28: 215-220. Tanaka, M., E. Misawa, Y. Ito, et al. Identification of five phytosterols from aloe vera gel as anti-diabetic compounds. Biol. Pharm. Bull. 2006, 29 (7): 1418–1422. Beppu, H., T. Koike, K. Shimpo, et al. Radical-scavenging effects of Aloe arborescens Miller on prevention of pancreatic islet B-cell destruction in rats. J. Ethnopharmacol. 2003, 89(1): 37–45. Chang, W. T., B. J. You, W. H. Yang, et al. Protein kinase C delta-mediated cytoskeleton remodeling is involved in aloe-emodin-induced photokilling of human lung cancer cells. Anticancer Res. 2012, 32(9): 3707-3713. Liu, K, C. Park, S. Li, et al. Aloe-emodin suppresses prostate cancer by targeting the mTOR complex 2. Carcinogenesis. 2012, 33(7): 1406-1411. Radovic, J., D. Maksimovic-Ivanic, G. Timotijevic, et al. Cell-type dependent response of melanoma cells to aloe emodin. Food Chem. Toxicol. 2012, 50(9): 3181-3189. Lu, J.J., J. L. Bao, G. S. Wu, et al. Quinones derived from plant secondary metabolites as anti-cancer agents. Anticancer Agents Med Chem. 2013, 13(3): 456-463.